Jean Anne Kiewel, P.C. - Brattleboro Law Firm | Vermont Family Law, Wills and Estate Planning, and Real Estate Attorney | Jean Anne Kiewel, P.C. For more than 30 years, Jean Anne Kiewel, P.C. 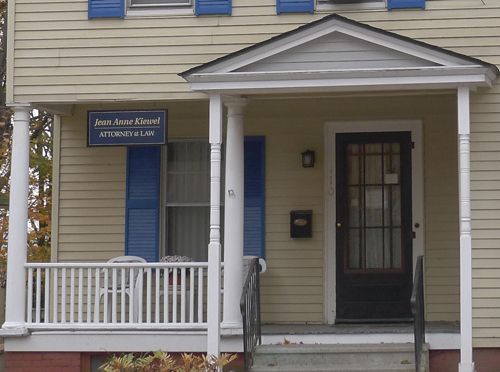 has served Vermont clients in family law, wills and estate planning, and real estate transactions. Located in Brattleboro, we represent clients throughout Southeastern Vermont, including Windsor and Windham, and in Bennington in the Southwest area of the state. If you are going through a divorce and need assistance with a child custody agreement, or if you are looking for an attorney to draft your will or review the contract for the purchase of a home, Jean Anne Kiewel, P.C. has the skills and experience to represent you. Skilled representation — At Jean Anne Kiewel, P.C., we deliver effective mediation and litigation services to our clients. We draw on our extensive file of case histories to benefit your case. Assertiveness — We stand our ground in the face of aggression and do not back down to bullies. Compassion — We understand that our clients have problems that affect their lives significantly, and we believe in building a relationship with you as we build your case. It gives us great satisfaction to help our clients take control of their lives and get back on track to a good future. Superior client service — You receive personal attention from start to finish of your legal matter. We are accessible and responsive, answering questions and responding to emails and phone calls promptly. Jean Anne Kiewel, P.C. handles family law, wills and estate planning, real estate transactions and small business. Family law — We have experience in divorce, child custody, guardianship, spousal support, distribution of assets, domestic violence and adoption. Wills and estate planning — Jean Anne Kiewel, P.C. assists clients with wills, estate planning, probate, estate administration, durable powers of attorney, healthcare proxies and general powers of attorney. Real estate — We handle residential real estate transactions, including closings and review of sales contracts. Small business — We help organize and administer small businesses, perform civil rights compliance reviews and consult with and represent employers and employees in negotiations, administrative hearings and litigation. Discuss your family law, estate planning, real estate or small business issue with a skilled attorney. Call Jean Anne Kiewel, P.C. at 802-258-2601 or contact us online to schedule an initial appointment.